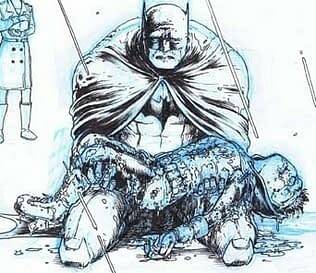 Now that we’ve seen the final art pages of Batman Inc #8, it’s clear that a few editorial changes were made. Here’s a compare and contrast of the published art and Chris Burnham‘s pencils. In the Damian kebab scene, the detail on Damian’s face has gone, as has the detail to the body, now lost in shadow. Say, is anyone cosplaying this scene at WonderCon? With a Robin-on-a-stick? In One Week, In Two Weeks – An Englishman In New York. Coming Back To London.